Harpo, Inc. is a privately held company owned by talk-show superstar Oprah Winfrey and her longtime lawyer, Jeff Jacobs. The backbone of the company, however, is Winfrey, who is one of the most celebrated personalities in the world. Harpo, which is Oprah spelled backwards, is really an extension of Winfrey the person. Its projects reflect her tastes and her desire to bring a measure of control and spirituality to her life. With Harpo, Inc., Winfrey used her popularity on television to expand into movie production and publishing, making her the most successful African American business owner in the United States, and one of the wealthiest entertainers in the world. The roots of Harpo can be traced to 1983, when Winfrey moved to Chicago, Illinois. After hosting a local talk show in Baltimore, Maryland, for several years, she began hosting A.M. Chicago on WLS-TV. Winfrey went head-to-head with the reigning king of morning talk shows, Phil Donahue (1935-). Also based in Chicago, Donahue reached a national audience through syndication. This means that although his show was produced in Chicago, it was sold to other television stations across the country. Although Donahue was well known, Winfrey immediately clicked with Chicago viewers. Within a month, her ratings beat Donahue's in the region. In 1984, Winfrey's agent negotiated a new deal with WLS that gave her an annual raise of $30,000 for the next four years. Winfrey, however, was not comfortable with the agent. She fired him and hired attorney Jeff Jacobs to represent her. 'I'd heard Jeff is a piranha," she told Forbes in 1995. "I like that. Piranha is good." Jacobs's first important move was to get control of Winfrey's show from WLS. WLS, owned by the ABC network, had the syndication rights, and TV networks were not allowed to syndicate shows. This means that Winfrey's program would be stuck in the Chicago market. 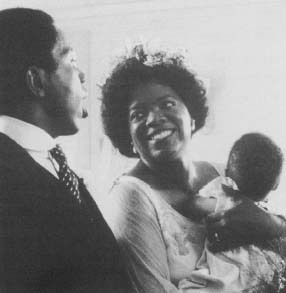 Jacobs convinced the network to give Winfrey the rights. ABC agreed, as long as ABC stations in other cities were given first shot at airing the program. Jacobs changed the name of the program to The Oprah Winfrey Show and worked out a deal with King World Productions for syndication. King World already syndicated the popular game shows Wheel of Fortune and Jeopardy! In 1986, The Oprah Winfrey Show first appeared nationally, and Winfrey proved as popular across the country as she had been in Chicago. Her show earned $115 million during its first two years of syndication, with Winfrey getting a share of the profits. In 1986, Oprah set up Harpo Productions, Inc, making herself chairwoman. She gave Jacobs 5 percent ownership in the company (his share rose to 10 percent when he became company president in 1989). In 1987, Jacobs shut down his private law practice to devote himself to Harpo full-time. His next big move for the company was making Winfrey the owner of her show. He struck that deal with ABC and King World in July 1988, giving Winfrey the freedom to schedule and program the show as she chose. Right after closing the deal, Winfrey bought a film production studio in Chicago. She planned to broadcast her show from there and to use the studio for other projects. George Mair, author of Oprah: The Real Story, quotes Winfrey's explanation for buying the studio: "I did this to really expand into the areas I wanted to and take over the show to create more time for me to do features and TV specials." Oprah Winfrey moves to Chicago to become the host of A.M. Chicago. Winfrey hires attorney Jeff Jacobs as her agent and business manager. A.M. Chicago become The Oprah Winfrey Show as Jacobs plans to syndicate it. Winfrey forms Harpo Productions, Inc.
Harpo buys a film studio in Chicago. Harpo Productions releases the TV movie, The Women of Brewster Place. Harpo signs a deal with ABC to produce six made-for-TV movies. Winfrey introduces a monthly book club on her show, dramatically boosting sales for her featured books. Winfrey becomes a partner in Oxygen, a new cable TV network aimed at women. The first issue of O, the Oprah Magazine hits newsstands. Winfrey announces her plan to stop producing her show in 2006. Oprah Winfrey made her debut on the big screen in The Color Purple in 1985. Reproduced by permission of The Kobal Collection. ratings were high, and the next year, Winfrey produced a TV series based on the movie. Brewster Place was the first show filmed in the new Harpo Studios. The show, however, was not as popular as the movie and ABC quickly cancelled it, although the network continued to broadcast films produced by Harpo. ABC also aired an hour-long interview Winfrey conducted in 1993 with singer Michael Jackson (1958-). By 1993, Winfrey was worth an estimated $250 million. And, like only a handful of celebrities, she was so famous that she was known by just her first name. Regardless, Winfrey did not escape criticism. Even though her talk show was number one in the country, the segments often featured sensational topics and guests, such as devil worship and members of racial hate groups. One critic was Vicki Abt, a professor of sociology. In 1994, Abt attacked Winfrey and other talk-show hosts for featuring trashy topics. The professor met with Winfrey and made suggestions for improving her content. The same year, Winfrey's show began to take on a more positive, uplifting tone. In 1995, she told Ebony she was disgusted with talk shows that "are designed to appeal to the lowest sense of ourselves, the bottom of what people experience." At first, Winfrey's ratings fell a bit with her new format, but they soon recovered. By 1998, her show reached about fifteen million viewers every day and was broadcast in dozens of countries around the world. Harpo Productions continued its work with ABC, signing a deal in 1995 to produce six made-for-TV movies. The company also remained interested in producing films for theater release. Its first feature film, Beloved, was released in 1998 by the Walt Disney Company (see entry). Based on a novel by Nobel Prize-winner Toni Morrison (1931-), the movie featured Winfrey, but it was not a hit with the public. Harpo had better luck with two TV films released during the 1997-98 season, Before Women Had Wings and The Wedding. The movies had high ratings and won praise from critics. Harpo Productions had one of its biggest hits ever in 2000 with the made-for-TV movie Tuesdays With Morrie. Featuring acclaimed actor Jack Lemmon (1925-2001), the movie won four Emmy Awards, television's highest honor. Still, Winfrey's success came primarily from her daily show, as she proved in 1996 with the introduction of Oprah's Book Club. Once a month, Winfrey selected a book she enjoyed, and featured the author on her show. After a show aired, sales for a Winfrey pick skyrocketed, often by as much as one million copies. Winfrey ended the book club in 2002, disappointing many authors and publishers, but she promised to promote worthy books as she discovered them. Oprah Winfrey spent $20 million to buy and renovate the space that would eventually become Harpo Studios. The studio covers 88,000 square feet and features three separate sound stages. Sound stages are areas where movies and television shows are filmed. The development of Harpo Studios made Winfrey just the third American woman ever to own her own studio. Winfrey continued branching out into new media in 1998. Harpo Productions, along with ABC Internet Group, launched Oprah.com . The Web site let viewers of Winfrey's show keep track of recent book club selections, suggest topics for future shows, and share their thoughts on personal subjects. The same year, Harpo Group LLC joined with several partners to form Oxygen, a new cable channel dedicated to women and their issues, which also had its own Web site. Before Oxygen's debut in 2000, Winfrey told Newsweek her goals for the network. "If we can create on this network what we've been able to create on the 'Oprah' show, then we'll be highly successful." Harpo's first production for Oxygen was a twelve-part series featuring Winfrey helping women learn about the Internet. Although Oprah Winfrey has millions of fans, not everyone has had kind words for her or her show. In 1994, a former employee quit Harpo, Inc., and sued the company for back pay. She claimed she left Harpo because of the "environment of dishonesty and chaos." Winfrey settled the suit out of court two years later, and today all Harpo employees sign a statement promising never to speak publicly about Winfrey or her company. In 1998, Winfrey was involved in a very public court case. On a 1996 show that examined how cattle are raised and the possibilities of getting "mad cow disease" from tainted beef, Winfrey said she would never eat another hamburger. Soon after, prices for cattle began to fall, and several Texas cattle ranchers sued her under the False Disparagement of Perishable Foods Products Act. This Texas law prohibits making false statements about food produced in the state, if the statements hurt business. Some people noted that cattle prices were already falling before Winfrey's comment, but the case went to trial in Amarillo, Texas, in January 1998. Instead of avoiding publicity over the lawsuit, Winfrey moved her show to Amarillo for the length of the trial. On her shows there, she praised Texas culture and won the support of the local citizens. In court, she defended the fact that she and her guests had the right to speak their minds. According to Texas Monthly, she testified: "I provide a forum for people to express their opinions.… We are allowed to do this in the United States of America." Winfrey won the case, defeating the cattlemen on their own turf. Two months after Oxygen came on the air, Winfrey entered the publishing business with her own magazine 0, the Oprah Magazine. After just seven issues, 0 had two million subscribers, making it the most successful new magazine in U.S. history. Although Winfrey worked with Hearst Magazines in producing 0, she had complete control over its content. The magazine was a print version of her show, featuring interviews with celebrities and articles on how readers could find more meaning in their lives. 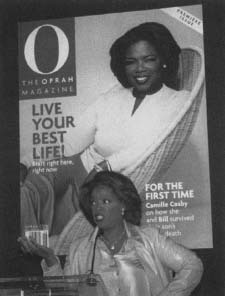 Oprah Winfrey standing in front of the cover of the premiere issue of 0, the Oprah Magazine. 0 debuted in April 1999. In 2002, Winfrey announced that was going to stop producing her show in 2006, although she had talked about quitting before and changed her mind. 0 also continued to make a substantial profit. Winfrey told Fortune that of all her accomplishments, she was most proud of her magazine "because I didn't know what I was doing." Oxygen, however, was struggling to gain viewers. In 2002, Winfrey cut a deal to do a new evening program for the network. Winfrey, however, remains committed to television and finding new ways to help and entertain others. "I believe I'm just getting started," Winfrey said at a speech she gave in 2001. "If you're open to the possibilities, your life gets bigger, grander, bolder!" This is a great summary of your achievements. However, I am writing to ask you to publish a few of my poems that I think will be of interest to you. It was published in the International Library of Poetry. It was awarded Editor's Choice Award. If you are interested please contact me at the above email or at 386-986-3339. Thank you.